Preheat oven to 400°. Heat olive oil in a 10” oven-safe skillet over medium heat. Sauté leeks & bell pepper until tender. Set aside to cool. In bowl. whisk eggs, milk, lemon zest, salt, pepper, cheese, parsley & Tomato Herb Bruschetta Spread. Stir in potatoes, leeks, and bell pepper. Wipe skillet clean with paper towel and coat bottom and sides with oil. Heat pan over medium heat. Add eggs, tilting pan to evenly distribute. Cook for 2 minutes. Remove from heat and bake in oven for 8-12 minutes or until puffed and set in the center. 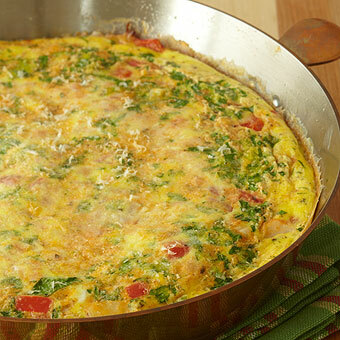 Cut frittata into wedges and serve hot or at room temperature.